We warmly welcome all your contributions of articles, letters, sports reports, events and photographs, just submit an article using the form below or email the editor and it will appear in the next issue of the relevant Community News magazine. 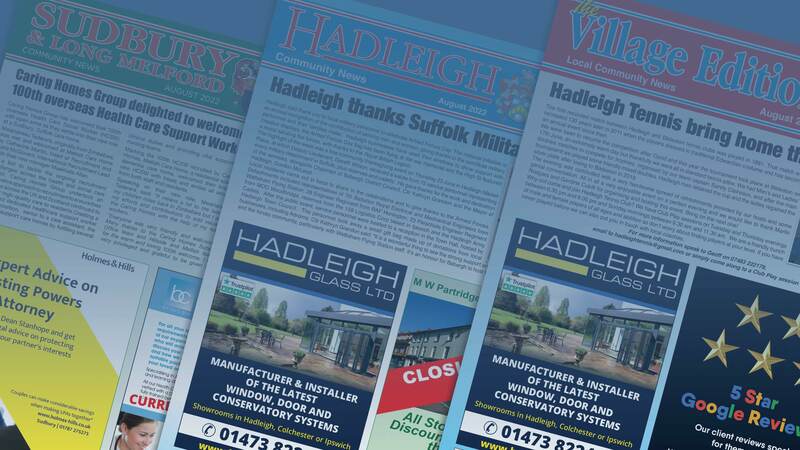 Hadleigh Community News is delivered to 5,200 homes and businesses in Hadleigh, Upper Layham and Lower Layham. Sudbury & Long Melford Community News is delivered to 7,600 homes during the first week of each month. The Village Edition is delivered to 6000 local homes in Lavenham, Kersey, Bildeston, Capel St Mary, Chelsworth, Boxford, Milden, Edwardstone, Groton, Whatfield, Monks Eleigh, Elmsett, Hintlesham, Polstead, Newton Green, Raydon and Hitcham, plus outlying homes in these areas. A combined total of 18,800 copies of these local Community News magazines are delivered monthly. Delivery takes place during the first week of each month. To advertise in any of our magazines (Hadleigh Community News, The Village Edition or Sudbury & Long Melford Community News), just give Matt a call on 01473 823366 or email matt@keithavis.co.uk. A total of 18,800 copies of these local Community News magazines are delivered to homes and businesses monthly. Deadline for copy is the 18th of each and every month. During the past twenty years the Community News magazines have established themselves beyond doubt as the most successful community news and business link magazines with the people of Hadleigh, Sudbury and the surrounding areas. Editorially most organisations such as the Hadleigh Town Council, Sudbury Town Council, Babergh District Council, Suffolk County Council, along with the support of local churches, clubs and associations use the Community News to pass informative views and information to the residents of the area, whilst many business users have long realised the immense pulling power of its advertising content. Delivered free to households and businesses in Hadleigh, Upper Layham and Lower Layham. Delivered free to local households and businesses in Sudbury and Long Melford. Delivered free to every households and businesses in the following villages: Lavenham, Kersey, Bildeston, Capel St Mary, Chelsworth, Boxford, Milden, Edwardstone, Groton, Whatfield, Monks Eleigh, Elmsett, Hintlesham, Polstead, Newton Green, Raydon, Hitcham plus outlying homes in these areas. Copies of these magazines are also made available at local Farm Shops, Community Shops, Village Stores, Public Houses, Restaurants and Newsagents etc in the surrounding area. Advertising in the Community News has proven to be extremely effective and I believe the best vehicle to promote your business or service to our local communities. Our prices are fully inclusive of artwork to our design and proofs are always supplied to customers for checking before publication. We also offer a leaflet delivery service within the Community News Magazines, any quantity up to 18,800 can be distributed at £40.00 plus VAT per 1000 leaflets delivered. The magazines are designed, printed, bound and delivered entirely by our own staff giving you guaranteed quality and distribution reliability. Advertising prices vary according to size and publication with discounts available for 3, 6 and 12 month bookings. Simply give us a call to discuss your requirement and we will give you a quotation. Hopefully the Community News can be of assistance to you and should you require any further information, please do not hesitate to contact us. Please use the form below to submit your article. If you have any photos to include, please send them separately via WeTransfer and include the name of your article.